Epicuren Discovery Skin Care is a skin care line originating from California and based on an enzyme protein complex which was first tested on patients with burns, in order to restore the skin. Epicuren’s core skin care philosophy is based on a six-step system that improves skin appearance after regular use. Basic daily routine includes daily cleansing, a weekly scrub to remove dead cells, toning plus lightweight enzyme containing gels and emulsions. Best sellers of the Epicuren Skin Care line include concentrated enzyme face creams & serums, Alpha Lipoic Omega, Pro-Collagen III. The extensive line has products that could be perfect for all skin types. 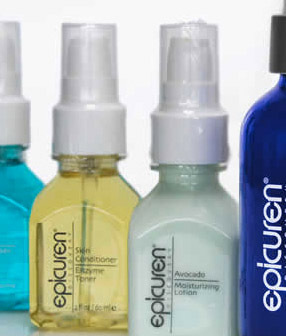 Epicuren has also developed skin care solutions to answer other skin problems. For example, there is an assortment of solutions for acne prone or oily skin including anti-acne cleansers, toners and creams as well as some with include benzoyl peoxide and effective exfoliants.